DOYLESTOWN (PA) – Delaware Valley University junior quarterback Dashawn Darden rushed for 133 yards and four touchdowns and also threw for a score as the fifth-ranked and undefeated Aggies scored 41 unanswered points and routed Widener University, 47-13, to clinch the Middle Atlantic Conference (MAC) championship and a berth to the NCAA Division III playoffs. 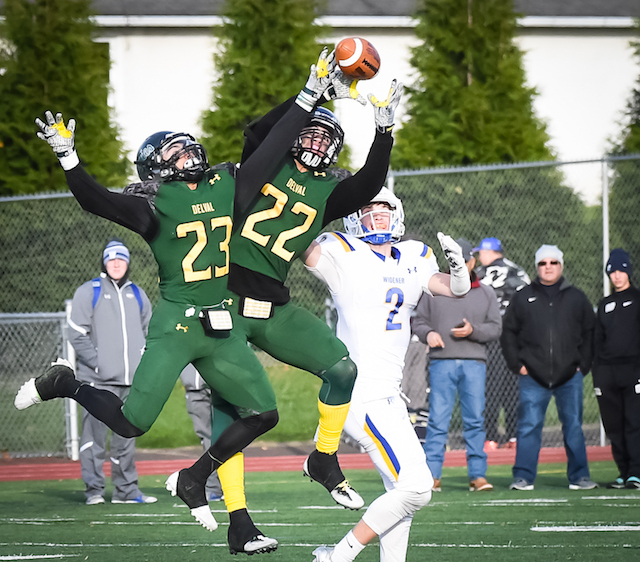 DelVal finished the regular season 10-0 for the fourth time in program history (2004-05-11) while capturing its seventh conference championship (sixth outright) since 2004. The Aggies will also head to the NCAA Division III playoffs for the seventh time since ’04 and will make their first appearance since 2014. DelVal should get a favorable seed and, perhaps, be atop one of the four brackets when the 32-team championship field is announced at 5:30 p.m. on Sunday (the team will watch the Selection Show in the Life Sciences Building Auditorium on campus). The game had everything on the line, including the Keystone Cup which is handed out annually to the winner of the rivalry game. The Pride (7-3, 7-2) entered the contest just one game behind the Aggies in the MAC standings meaning a win would have both teams sharing the conference crown and Widener getting the automatic berth to the NCAAs with the head-to-head victory. Instead the Pride will be on the road (opponent TBA) for the Centennial-MAC Bowl Series next Saturday. 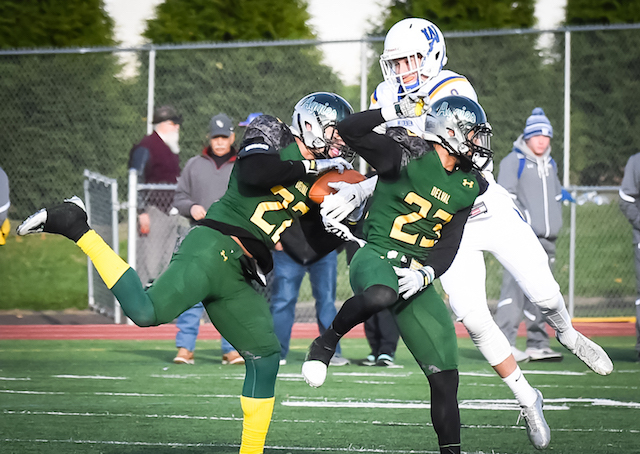 Darden made sure that DelVal would not share the title and have to wait to see if the team got an at-large berth to the NCAAs, especially after leading rusher Devauntay Ellis went down with an injury with 7:12 left in the first half and did not return. Darden did it with his legs and touchdown runs of 17, 28, 11 and 1 yard(s). In fact, behind their offensive line, the Aggies punished the Widener defense with 366 yards on the ground and 431 total yards. The Pride got off to a quick start as, after stopping DelVal on its opening drive, they went 58 yards on eight plays. An offside penalty on the Aggies on fourth down kept the possession alive and Rob Ennis, Jr. capped it with a one-yard touchdown run. Michael Raczak added the extra-point for a 7-0 Widener lead just 6:41 into the game. 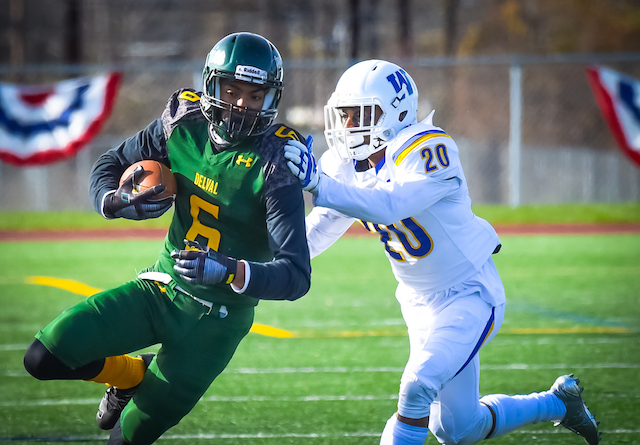 It marked the first time all season that DelVal trailed in a game. Back came the Aggies as they marched 61 yards on six plays. Five of the plays were on the ground, including the final 17 yards by Darden for his first touchdown of the day. However, the extra-point attempt clanked off the right upright, leaving DelVal down 7-6 with 5:22 left in the quarter. The back-and-forth continued as Widener, behind two passes of 69 yards combined by quarterback Sean McGaughey, moved the ball to the Aggie one-yard line. Ennis, Jr. took care of the rest for his second touchdown of the game. However, Marc Isaac blocked the extra-point attempt and Sammy Mohr returned it the distance for two points for DelVal, which trailed 13-8 with 3:22 left in the first quarter. That began the run of 41 straight points by the Aggies, including the ensuing drive as Darden scored on a 28-yard run. Another point-after attempt hit the right upright, but DelVal took the lead for good at 14-13 with 79 seconds left in the quarter. On the Aggies’ next possession, they drove 42 yards on six plays. Ellis stiffed-armed a tackler and got to the right pylon for a six-yard touchdown and a 21-13 advantage four minutes into the second quarter. Widener drove down the field and had a third-and-14 from the DelVal 25, when McGaughey had a pass intercepted by Mohr at the one. 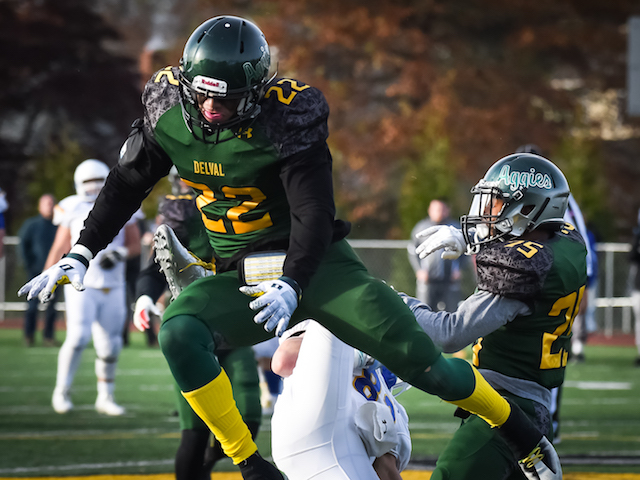 The Pride stopped the Aggies and then drove down to the three-yard line, but Raczak missed a 20-yard field goal attempt and the half ended with DelVal up eight. Widener had possession to start the second half, but McGaughey was picked off by Jarren McBryde, who returned it 26 yards to the Pride 46. A 12-yard run by Darden on a third-and-one moved the sticks, and he then lofted a pass into the end zone which Marquis Ellis snagged and held onto for a 25-yard score and a 27-13 Aggie advantage with 10:31 remaining left in the third. Later in the third, Widener went back to punt on a short field to try to trap the Aggies. However, a fumble on the snap resulted in a 14-yard loss and gave DelVal the ball at its own 48. Four plays later, Darden was in the end zone again, this time from 11 yards out and a 33-13 score with just 34 seconds to go in the third quarter. McGaughey was intercepted by Shawn Miller on the first play of the ensuing possession. DelVal turned it into points as a Khalil Roane 38-yard run keyed the drive that ended with Darden’s one-yard sneak into the end zone that made it a 40-13 contest. The final points came from the defense as Miller, a preseason All-American safety, intercepted a pass at the Widener 43, jumped over two players and went the distance for a 47-13 score with 9:29 remaining. All that was left was the Gatorade baths for head coach Duke Greco and some of the assistant coaches. Darden got his rushing yardage total on 17 carries and he was 4-for-7 for 65 yards and one score in the air. Roane carried the ball 10 times for 106 yards, most after Devauntay Ellis’s injury. Ellis had 14 carries for 75 yards and one score at the time. Defensively, the Aggies were led by Nicholas DiGati’s nine tackles. McBryde finished with six stops and an interception while Miller had four tackles and two picks. Vincent DiLeo and Christian Snowden had three tackles and one sack apiece. 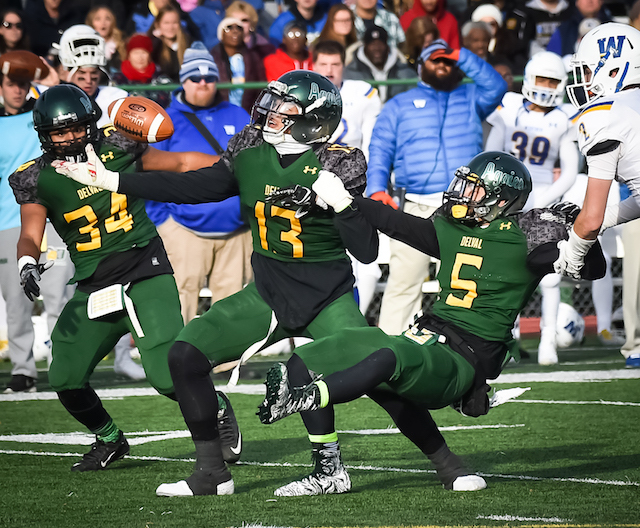 The Pride had 353 total yards, the most produced on DelVal this year, but they finished with minus-nine yards rushing on 28 attempts. McGaughey was 21-for-41 for 340 yards, but was intercepted four times. Pat Downey had eight catches for 132 yards. Vince Char and Casey Kerschner notched eight tackles apiece with Char getting the team’s lone sack of the game.